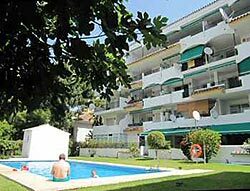 Cabopino apartments for holiday rental, near Calahonda, Costa del Sol, Spain. Our Costa del Sol apartments, available for holiday rental all year round, are situated near Puerto Cabopino beach and marina and Calahonda, 7 miles (12km) north of Marbella, and only 20 minute's drive from Malaga airport. This area is also known as Mijas Costa. Watch the video of the view from the apartment balcony and the beach and marina at Cabopino. This is a quiet area within easy walking distance to Cabopino and Artola beaches. 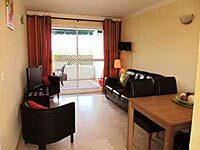 The apartment block is mainly residential, suitable for those who like a relaxing holiday away from the large resorts, but with good quality restaurants and cafe/bars nearby. With so many low cost airlines now flying into Malaga, why not treat yourself to a short sunny break or family holiday on the Costa del Sol? Our low season rate (November to March) is just 259 euro per week for our two bedroom apartment, sleeping up to four guests. Please click the links on the left for our rental rates, accommodation details and Malaga flights information. Click to see a video of our Cabopino apartments plus beach and marina. Pictures of this apartment near Cabopino. The apartment block is situated just off the main coastal highway N340, on the beach side of the road. There is a swimming pool on the apartment grounds for guests. In the vicinity of the apartments you will find a late night Supermarket, Mini-market, Bank, hairdressers, Pharmacy, beach/souvenir shops and also a selection of good quality restaurants and cafe/bars. You will find spanish, italian, steak-barbecue, german, chinese, indian and seafood restaurants close by. The beach and sand dunes (a protected natural area) of Cabopino are less than 10 minute's walk by the quickest route along the main road into the family beach or marina area. The picturesque port and marina of Puerto Cabopino can also be reached by a leisurely stroll along the beach from Artola to Cabopino. With its beautiful Marina, sea fishing, beach sports and excellent restaurants and bars, where freshly caught seafood is the speciality, Cabopino is one of the jewels of the Costa del Sol - read an article in a local newspaper about the area. There is a well-hidden nightclub open in the port area in the Summer months and a lively plaza area surrounded by cafe/bars. 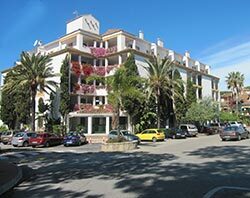 Calahonda, Mijas Costa is the nearest main commercial centre, (3 stops on the local bus or 20 mins walk) with large Supermarkets, McDonalds and all amenities. There is a lovely open air terraced dining area with 8 restaurants and bars above the SuperSol, and plenty of night-life including a nightclub on The Strip. This part of the Costa del Sol is in the heart of the "Costa del Golf", which boasts many landscaped 18-hole golf courses within easy reach, including the 18 hole Cabopino course close to the apartments. Las Chapas, Miraflores and Siesta courses are also nearby. Golf packages to any course can be arranged at discounted rates, also taxi or car hire from Malaga airport. Coach tours and day trips can be arranged locally from Hotel Artola, to visit family attractions such as Selwo Animal theme park, Tivoli World at Benalmadena, the Aquapark and Zoo at Fuengirola or dolphin watching and sea fishing off the coast. Shopping trips to Gibraltar, the caves of Nerja, and places of historical interest such as Granada, Seville and Ronda are also popular day trips. 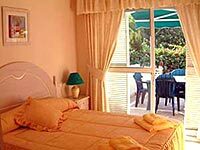 These holiday rental apartments are located in a quieter area of Costa del Sol, in a small (32 apartments) and mainly residential 4-storey block on the outskirts of Calahonda, very near to Puerto Cabopino beach and marina. 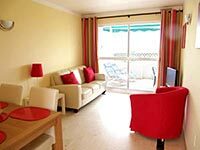 These apartments suit holidaymakers and families who prefer to be within easy reach of popular destinations such as Calahonda, Fuengirola, Marbella and Puerto Banus, but not to be located in the centre of a busy resort. Our caretaker meets guests on arrival at the apartments with the keys, and will be glad to answer any questions about the area. For your convenience, there are booklets and maps in the apartments describing the visitor attractions and amenities on the Costa del Sol and a map of the local area showing the location of nearby shops, restaurants etc and the Calahonda and Cabopino area. On this website you can view pictures of the interior of the apartments and the surroundings. 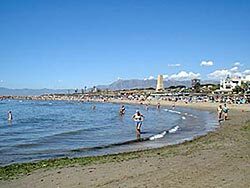 There is also a page describing the visitor attractions and things to do in the local areas of Calahonda, Cabopino and Fuengirola, also the entire Costa del Sol, with a list of local website links for further reading. You can view the rental price list for our Cabopino apartments in Artola Gardens and make a booking enquiry. Once your booking has been confirmed, you can pay your rental deposit by bank transfer or by credit card via PayPal. Flight timetables for Malaga airport from the UK and Ireland can be accessed, and you can also check flight availability and price, and book direct online. Car hire can also be booked and you will find links to driving maps for the area on that page. Should you need any further information from the owners, please send an e-mail. We appreciate your feedback and would be grateful if you would post any comments you may have about this website or your holiday on the Costa del Sol in our guestbook. Artola Gardens apartments and car park. on the sheltered lawn in the garden. (See searchbox below for Irish airports).